The New England Patriots have gone to the Super Bowl each year that Donald Trump has been president, and as his favorite team claims another Super Bowl win on Sunday, the president's relationship with the Pats and star quarterback Tom Brady is back in focus. The Patriots defeated the Los Angeles Rams, 13-3, in Super Bowl LIII, clinching their third championship since 2015. Trump has repeatedly hailed the Patriots as "winners," touted his friendly relationship with Brady, team owner Robert Kraft and head coach Bill Belichick and has even suggested as a candidate and president-elect that they supported his presidency. He has also dined with Kraft at his Mar-a-Lago Club in Florida. When asked about his relationship with Trump, Brady has largely been evasive, but amid ongoing speculation about Brady's political leanings, football fans have continued to tie the Patriots to Trump. 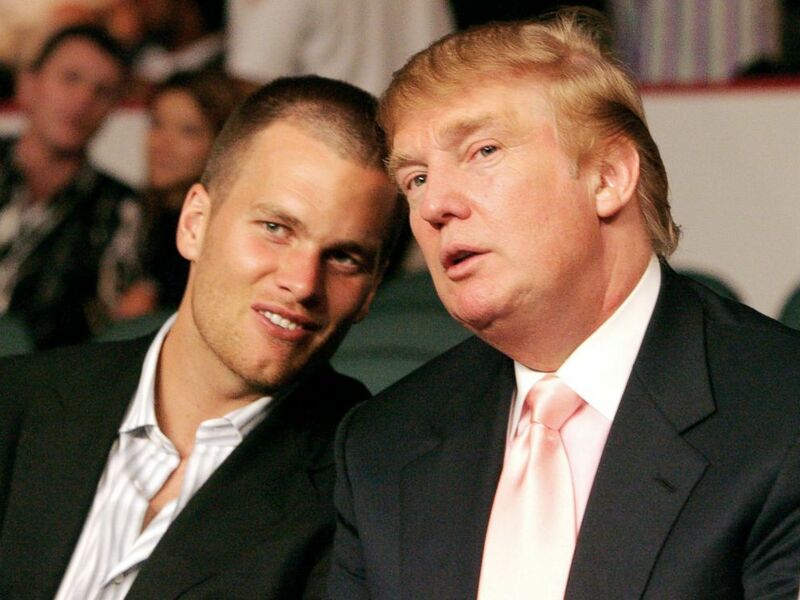 New England Patriots quarterback Tom Brady chats with Donald Trump at the WBC Lightweight Title Fight, June 25, 2005. In Sept. 2015, Brady was spotted with a "Make America Great Again" hat in his locker. He was also known to have golfed with Trump before the business mogul became president. During an 2015 interview on the Dennis and Callahan Interview Morning Show on Boston sports radio station WEEI, Brady confirmed that the hat was indeed from Trump. Last week, actor Daniel Radcliffe -- most known for his film role as "Harry Potter" but also a notable NFL fan -- told Variety that although he doesn't think the Los Angeles Rams will defeat the Patriots at Super Bowl LIII in Atlanta Sunday, he is rooting for the Rams "because the whole world is rooting against the Patriots, sorry." Asked if Brady should retire, Radcliffe said, "no," but "he should just stop winning things." "Take that MAGA hat of your locker! I feel like that was the moment where as a country, we were all like c'mon dude ... you're awesome, we're behind you, don't put that in there." Amid continued backlash from fans over the "MAGA" hat and a constant stream of questions about his politics, Trump put Brady and the Patriots back in the spotlight, announcing a day before the 2016 general election that Brady and Belichick are supporting his campaign for president while addressing thousands of supporters at a rally. "Donald, I support you, you're my friend and I voted for you," Trump claimed that Brady told him. Trump also read a letter he said he had received from Belichick, saying, "You've proved to be the ultimate competitor and fighter. Hopefully tomorrow's election results will give the opportunity to make America great again." Although Brady did not confirm nor deny the claims at the time, his wife, super model Gisele Bundchen, denied the reports in an exchange on Instagram. "Gisele I heard you and Tom were backing Trump! Is that true?" one user wrote. Then, while speaking at a pre-inaugural dinner, the president-elect said that Brady and Kraft called to congratulate him for winning the election. When asked on WEEI's Kirk and Callahan show in January 2017, Brady did not deny that he called Trump, but appeared to downplay it, saying, "I have called him, yes, in the past. Sometimes he calls me. Sometimes I call him." "But, again, that's been someone I've known. I always try to keep it in context because for 16 years you know someone before maybe he was in the position that he was in," he added. "He's been very supportive of me for a long time. It's just a friendship. I have a lot of friends. I call a lot of people." During the 2017 Super Bowl, which took place two weeks into Trump's presidency, fans compared the Patriots' historic comeback against the Atlanta Falcons to Trump's unexpected win against Democratic nominee Hillary Clinton in the 2016 presidential election. "What an amazing comeback and win by the Patriots. Tom Brady, Bob Kraft and Coach B are total winners. Wow!" Trump tweeted at the time. One day after the win, tight end Martellus Bennett told reporters that he would not participate in the traditional White House visit, where the Super Bowl LI champs were set to be honored by Trump. "Basic reason for me is I don't feel accepted in the White House. With the president having so many strong opinions and prejudices, I believe certain people might feel accepted there while others won't," Bennett said. 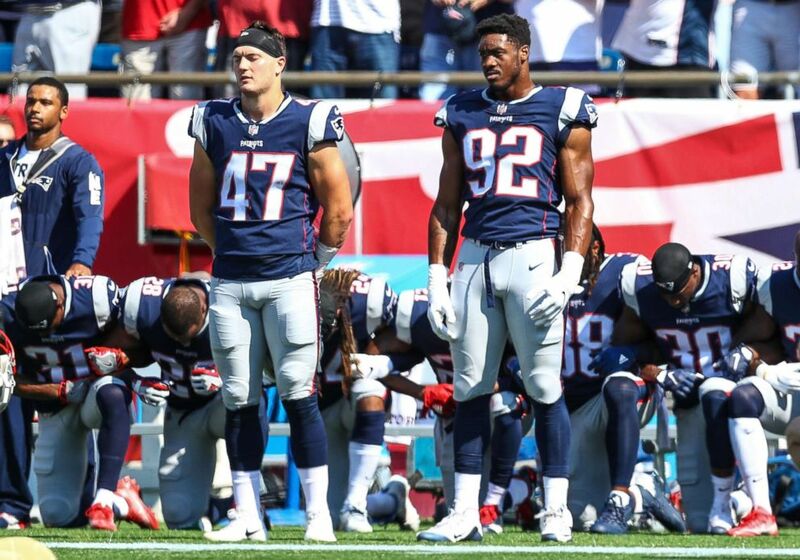 And after that, several other players including defensive end Chris Long, running back LeGarrette Blount, defensive tackle Alan Branch and linebacker Dont'a Hightower announced that they would also not attend, with some citing their opposition to Trump. But everyone wanted to know: What about Brady? After much speculation, the team's star quarterback surprised many when he announced on April 19 -- the day of the visit -- that he would not be joining his teammates at the White House. 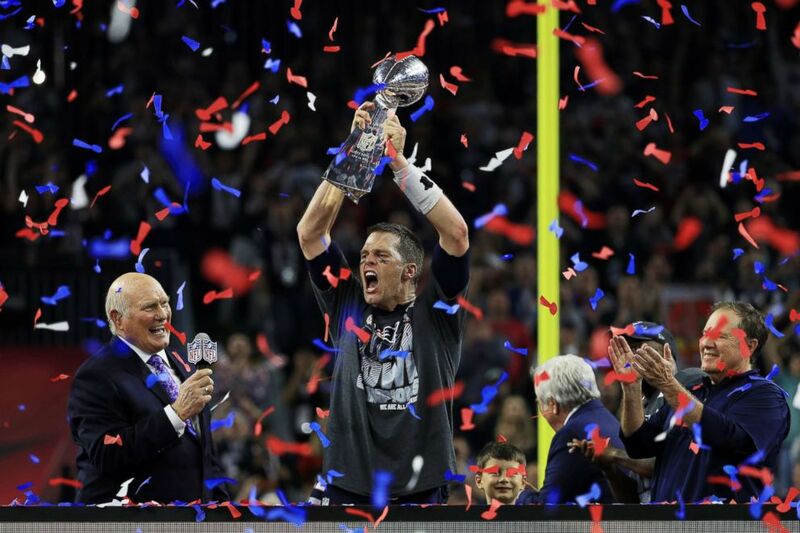 Tom Brady of the New England Patriots holds up the Vince Lombardi Trophy after defeating the Atlanta Falcons 34-28 during Super Bowl 51 at NRG Stadium in Houston, Feb. 5, 2017. Brady cited "personal family matters" and Trump did not publicly comment on Brady's absence. "I am so happy and excited that our team is being honored at the White House today," Brady said in a statement. "Our team has accomplished something very special that we are all proud of and will be for years to come. Thank you to the President for hosting this honorary celebration and for supporting our team for as long as I can remember. In light of some recent developments, I am unable to attend today's ceremony, as I am attending to some personal family matters. Hopefully, if we accomplish the goal of winning a championship in the future years, we will back on the South Lawn again soon." It is not uncommon for players to skips visits to the White House -- often citing scheduling issue. In 2015 Brady said that a "family commitment" prevented him from attending the ceremony held by then-President Barack Obama. Trump ignited a public war with the National Football League and some of the league's biggest stars when he slammed black players like former San Francisco 49ers quarterback Colin Kaepernick, who routinely took a knee during the national anthem to protest institutionalized racism and police brutality. Trump also lambasted NFL owners for allowing the protests to continue and called on fans to boycott games. The feud which has been ongoing for two years was sparked at a 2017 rally in Alabama, where Trump suggested that team owners should respond to players who protest and say, "Get that s-- of a b---- off the field right now, he's fired. He's fired!" When asked about Trump's comment in Sept. 2017 during an interview on WEEI's Kirk and Callahan show, Brady called Trump's comments "divisive" and voiced support for players who protest. Members of the New England Patriots kneel on the sidelines during the National Anthem before a game against the Houston Texans at Gillette Stadium on Sept.24, 2017n in Foxboro, Mass. “Yeah, I certainly disagree with what he said. I thought it was just divisive," Brady said. "Like I said, I just want to support my teammates. I am never one to say, ‘Oh, that is wrong. That is right.’ I do believe in what I believe in. I believe in bringing people together and respect and love and trust. Those are the values that my parents instilled in me. That is how I try and live every day." After hosting the Patriots in 2017, Trump rescinded a White House invitation to last year's Super Bowl champs, the Philadelphia Eagles, after several players announced that they planned to boycott the visit. 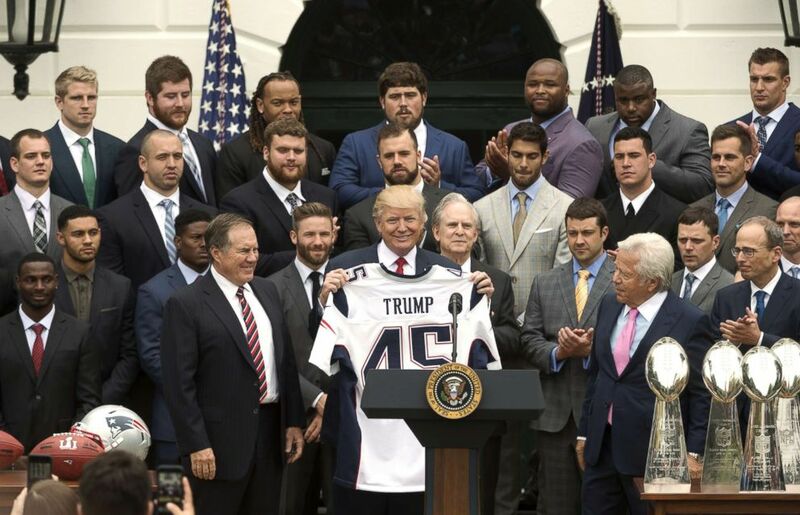 As the Patriots and Brady — who, at 41-years-old, is the oldest quarterback to play in a Super Bowl, make their media rounds and bask in another win, a question that cannot be avoided is whether they plan to visit the White House.